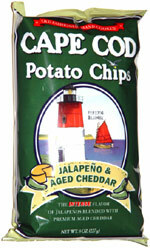 They've got all the great crunch and wiggly shape of Cape Cod's regular potato chips, combined with a very tasty and somewhat hot jalapeño flavor. 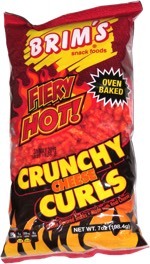 You don't really notice the cheddar flavor that much, because it's overpowered by the jalapeño, but the combination of the two flavors makes these extremely tasty. The taste is moderately hot, and it leaves a hot aftertaste in the back of your throat, but it's not supermegahot. Smell test: Mildly strong jalapeno smell with even milder cheese. Good. From the package: “The intense flavor of jalapeños blended with premium aged cheddar” ... “The Jalapeño Pepper, renown for its intense heat, is native to the tropics of Central and South America. Up until now, this distinct flavor has enjoyed enormous popularity in only the Southeast United States. We, at Cape Cod, decided to change that — we've blended the authentic extreme heat of the southwestern jalapeño with our Premium Aged Cheddar. The result is a spicy, yet creamy jalapeño cheddar flavor that is sure to please even the most discrimitating “heat junkies".